Book reviews (commentaries? notes? ), with distracted remarks on Other Topics of Interest. Prompted by a stray meeting with Acker at a recent reading in Victoria, it was time for me to revisit the book, to see whether my somewhat cranky first reaction was appropriate. And it wasn't, so I've posted an update comment there at the top of the page. This gentle volume is very impressive, and I'm really glad I came back to realize as much. 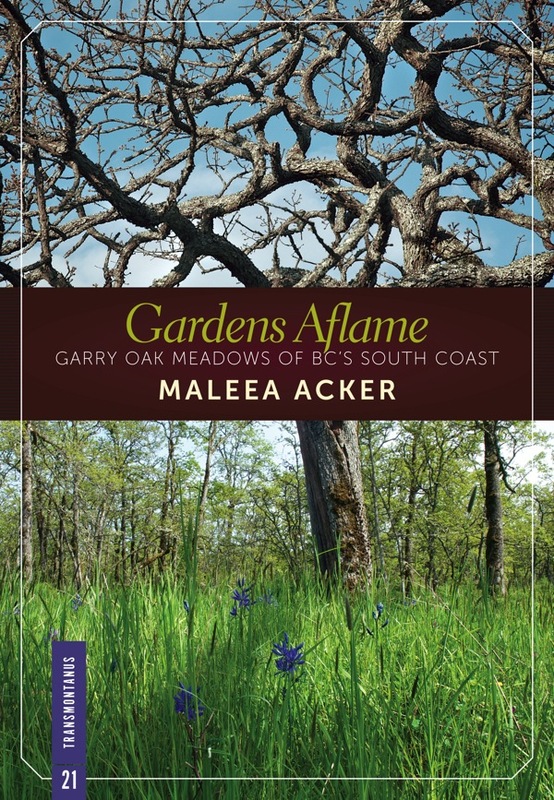 The trick with Gardens Aflame: Garry Oak Meadows of BC's South Coast is that it may not be the story you expect, or that you've trained yourself to expect from works of natural history tinged with personal memoir about the very recent past. The Garry oak is a remarkable tree, as the cover photo suggests, and as everyone who lives in Victoria should already know, and the camas flower (also on the cover) is a gorgeous late-spring gem. But Gardens Aflame isn't about these glamour species, and that's part of her ethic and her aesthetic in this book. Similarly, Acker mentions her recent marriage breakup, speaks warmly of walks with her rain-begrudging dog, and honours through personal narratives the ecologically minded people she meets, but it's also not about Acker and her recovery from trauma through nature. Gessner's thesis has found traction, and so natural history's former readers are now gleefully reading memoirs that exploit but bash natural history, pooh-poohing the delicate observer and yet receiving boxes full of the same for Christmas. Gardens Aflame, though, transforms nature writing by climbing more deeply inside the genre, rather than disrupting it. In some ways, Gardens Aflame represents the best of natural history writing. It's full of micro-stories (memoir, history, botany, natural history, geology); it's full of details that the author earned through time and energy spent in place, with people who already knew better; it delineates intransigent problems without being despairing, potential solutions without being programmatically helpful. 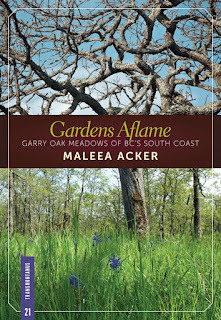 Acker rejects a focus on the charismatic species of oaks and camas in favour of the total meadow ecosystem (following Alexander Humboldt, in essence), and insists on small stories rather than an overall narrative. Through these decisions, Acker disrupts traditional nature writing not by getting loud, but by focusing her quiet onto the crucial issue of care. Nature writing often focuses on what we see: on what we experience, more broadly, but vision generally trumps the rest of the senses. I'm tired of witnessing, tired of admiring, and yet I'm not equipped to throw myself into advocacy, into action. In an ethic of care like Acker proposes in Gardens Aflame, I can find a home. And if I'd been able to see my fatigue as environmental depression when I first read this book, I would've found a home there the first time around. It'll stay on my bookshelf, and I hope it'll appear on yours before long. Teacher, reader, reviewer, bookbuyer. When in doubt, I choose writing from BC, environmental nonfiction, or poetry. I accept review copies from publishers, but I don't promise to read unsolicited books; if I do read something, though, I promise that I'll post an honest review.